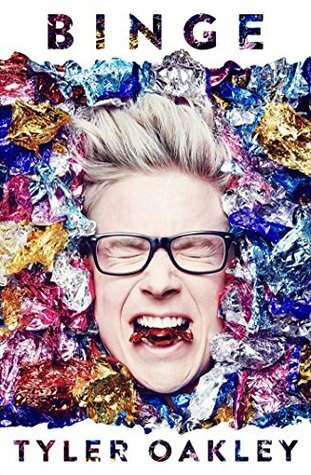 Tyler has been my YouTube Queen since 2012 and he never fails to make me laugh with his videos, so I was beyond excited to read what he had to say in his first book Binge, and what a delightful, indulgent treat it was. Binge isn’t a typical biography that chronicles his life from birth to where he is now. It’s more like what the cover suggests, you dip your hand into a bowlful of sweets and you never know what you’re going to pick out next. Tyler shares with us a look into various parts of his life that hold meaning to him, be it good, bad, or completely bizarre. What I especially loved about this book was the pure honestly within its chapters. Tyler isn’t afraid to talk about anything. Call it an overshare if you will, but he is unapologetic in writing about the details, and I loved every moment of it. There was an entire chapter on poop that I didn’t realise I needed in my life until I read it. I was crying with laughter over how absurdly hilarious it was. We are taken on an emotional rollercoaster with Tyler through his memories, laughing and cringing at some of his wild tales, but not every chapter is full of funny moments. What was also captivating about Binge was Tyler’s honesty about the darker times in his life, and the struggles he has faced. It made me view the work he does for The Trevor Project with a new admiration. There are also a few important lessons within the pages of Binge, reminding us on several occasions that it’s okay to indulge ourselves in order to find our own limits, and to never knock something until we try it (see for example chapter ‘Hopeless Toemantic’). Tyler on the page is exactly how you imagine him to be from watching his videos, he is still as brilliantly entertaining. He speaks to readers as friends, in a casual and fun way, so we’re able to feel as connected with him as we do whilst watching him speak his mind on YouTube. Binge left a huge smile on my face and I came away from this book feeling energised and positive. I’m so glad Tyler is able to share his story with us in book format because it works perfectly. Even if you’re not already a fan of Tyler through his videos, this book is so very enjoyable. I’d like to thank the wonderful people at Maximum Pop! for sending me a copy of Binge to review on their website, which you can read here. Top 10 Books of 2015!